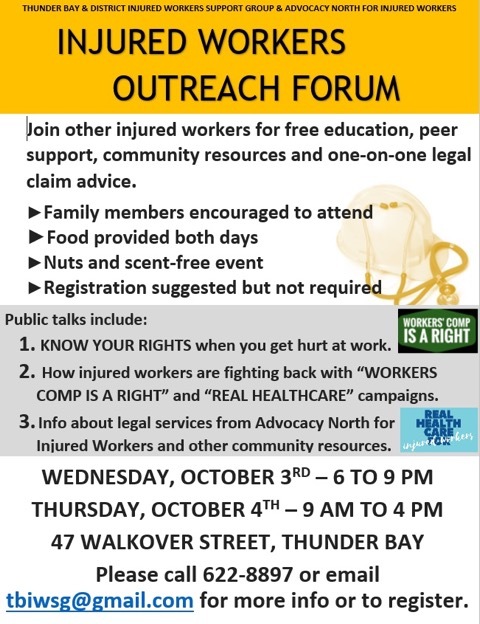 The Thunder Bay & District Injured Workers Support Group and Advocacy North for Injured Workers are hosting an Injured Workers Outreach Forum, beginning the evening of Wednesday, October 3rd and running thru Thursday, October 4th . We are inviting all injured workers (and interested parties) to participate. The forum will be held at Christ Lutheran Church at 47 Walkover St. – just behind McDonalds on Red River Road. Our Forum is planned to help vulnerable and marginalized workers, including those returning to work after an injury and those who may not have been injured, but have limited knowledge of occupational health and safety laws and available resources, to learn more about their rights and the laws that guide them as a worker in Ontario. It will include public legal education, summary advice for injured workers and peer support. For the first time in many years, injured workers in northern Ontario have access to a community legal clinic lawyer to help them with their compensation claims. 11 legal clinics in Northern Ontario have joined forces, creating the Advocacy North Project, to expand their services in employment law, injured workers law and elder/senior law along with community development and peer support work. The Thunder Bay & District Injured Workers Support Group welcomes the energy and the commitment of Catherine Boivin-Girard, Northern Regional Injured Workers’ Lawyer, home-based in Timmins, to our region and looks forward to the many ways in which she will be able to provide legal services to our injured workers. Please contact Janet Paterson at jlrwpat@tbaytel.net or (807) 472-6910 or our office at (807) 622-8897 or tbiwsg@gmail.com for more information.